First blurry look at protagonist revealed. 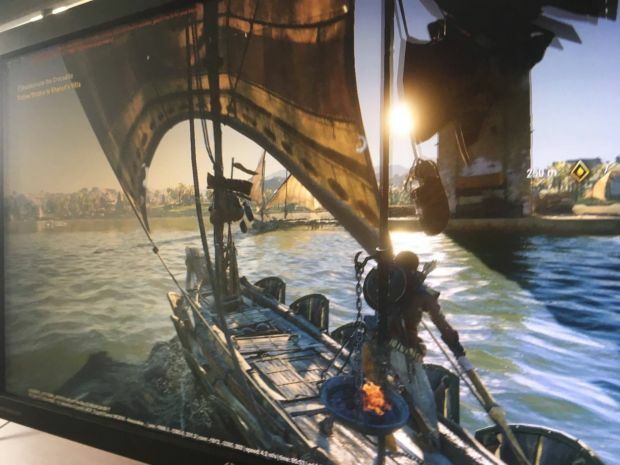 After it was rumoured that Assassin’s Creed: Empire, reportedly set in ancient Egypt, would actually be called Assassin’s Creed: Origins, a new image has been leaked showcasing the game’s overall visual look. Essentially an off-screen image that comes from Reddit, Eurogamer has since confirmed the image’s legitimacy. It showcases a character on a boat though it’s far from the naval warfare of Assassin’s Creed IV: Black Flag. Naval combat is rumoured to be making a return in Assassin’s Creed: Origins. We can also see the character wielding a bow and arrows. Despite the overall blurry nature of the screenshot, we’re liking the look of it so far. Assassin’s Creed: Origins is apparently in development for Xbox One, PS4 and PC and will serve as a prequel when it launches later this year. What are your thoughts on the so-called leaked image? Let us know in the comments below and stay tuned for more information.